1st: New Year's Day - An official holiday with little public celebrations. Special Masses. 6th: Three King's Day - Day of giving Christmas presents to children in accordance with the arrival of the three Magi to infant Jesus. This day culminates the Christmas time festivities. 17th: St. Anthony's Day - Blessing of the animals. The rites take place at various churches, sometimes also at La Parroquia. 21st: Birthday of General Ignacio Allende - Civic ceremony with band music at Plaza Cï¿½vica and a short parade. 24th: Departure for Pilgrims to San Juan de los Lagos - Departure ceremonies take place near the Train Station. 2nd: Candelaria's Day - Plants and seeds are sold in plazas and streets, mainly in Parque Juarez which is suddenly transformed into a gigantic garden. This coincides with Aztec New Year's Day, which is also dedicated to fertility. 5th: Mexican Constitution Day - Official holiday. Governmental offices, schools and banks are closed on this day. 24th: Flag Day - Civic ceremony honoring the Mexican flag. 5th: Carnaval Day - Carnavals take place at many places in Mexico and begins a five-day celebration before the Catholic lent. Parades, floats and dancing in the streets make for a great party. Port towns such as Mazatlï¿½n, La Paz and Veracruz are excellent places to watch Carnaval festivities. 7th*: First Friday of March - Concheros celebrate the feast of our Lord of the Conquest. Dancing in the atrium of the Parroquia. 17th: St. Patrick's Day - Small parade in town. 19th: Feast of San Josï¿½ - Celebrated mostly in small communities. In town, there's a small festival at Oratorio Church and Plaza Civica with fireworks and dances. 21st: Birthday of Benito Juarez - A famous Mexican president and national hero. It's an official holiday, governmental offices, banks, schools, closed. 21st: Beginning of Spring Season - For the Aztec culture this day was celebrated as New Year's Day. At archeological places, such as Teotihuacan, special ceremonies take place to celebrated the equinox. In town, there is a colorful parade with all children disguised as flowers or animals. 28th*: Two Sundays before Easter - Rites and celebrations begin. The image of Our Lord of the Column is carried through the night from the Sanctuary of Atotonilco to the church of San Juan de Dios in San Miguel. This is a dramatic march of thousands of people who walk for several hours, pausing frequently for prayers, songs, and rituals. The marchers are greeted by townsfolk at dawn. Fireworks, bells and rejoicing. Best seen at the old North entrance to town at dawn (follow the crowd) and at San Juan de Dios. Semana Santa, Holy Week is Mexico's second most important holiday season of the year, behind only Christmas. In addition to attending Mass on Good Friday and Easter Sunday, many Mexicans will also take advantage of the holiday to go on vacation. If you are planning to visit Mexico during Semana Santa (13-19 April*), make sure you checked on availability in advance. 11th*: Friday before Holy Week, Viernes de Dolores - Honoring Our Lady of Sorrows and known in San Miguel as Night of altars in homes. Early in the evening public fountains are decorated with flowers, fruits and sometimes lighted; later, many homes will be open so that passersby may inspect the household altars placed in windows or at the entrance. Hostess give fruit water or ice cream to visitors, the traditional water is made of orange with banana and lettuce pieces. Dozens of home altars are on display from about 9:00 AM until 10:30 PM. Many years attractive altars are found in homes on Calles Barranca, Hospicio, and Cuadrante. But these change and many other streets have appealing displays. follow the crowds, ask where more altars may be seen. This is undoubtedly the most open and welcoming night of the year in many houses. Semana Santa - The Holy Week, including Good Friday and Easter Sunday, that brings the 40-day lent period to an end. 30th: Child's Day - Festivals are offered to kids at schools, with small presents and games. 1st: Labor Day - Official holiday with a parade of workers and school children. On a deeper level to Catholic people, it is the start of 'Maria Month' special to the Virgin Mary, a time of celebration every Sunday in a different neighborhood church in San Miguel: Calderï¿½n, Barrio del Chorro, Las Cuevitas, Guadiana, Ojo de Agua, Cruz del Pueblo, La Palmita. 3rd: Feast of Santa Cruz, Holy Cross - The day of masons and builders. Altars are erected at all constructions sites. Work stops at noon and employers are expected to provide a party. The altars are often charming; the celebrants tipsy. Firecrackers continues exploding far into the night. 5th: Anniversary of the Battle of Puebla - National Celebration, triumph of General Ignacio Zaragoza against the French, Civic ceremony in the Main Garden. Dances performed during the week. The colorful costumes represent French and native forces; there is drumming, shouting and swordplay. 8th: Anniversary of the birth of Don Miguel Hidalgo y Costilla - Civic ceremony in the Jardï¿½n. 10th: Mother's Day - Due to the importance of the mother in Mexican culture, Mother's Day is an especially significant holiday. Festivals are often given to mothers in all schools. 13th: Ascension Day - A religious fiesta once of great importance in Mexico, now less notable. 15th: Day of San Isidro Labrador - The patron of agriculture, herds and flocks is honored mainly in the rural communities. Cattle are decorated with paper garlands, then blessed. The celebration is associated with bringing rain in the coming season. 17th: Commemoration of San Pascual Bailï¿½n - Patron of the Eucharistic Congresses, festival in the neighborhoods of San Juan de Dios and El Oratorio. 26th: Celebration of San Felipe Neri - Founder of the Congregation of the Oratorio. 30th: Fiesta at Valle del Maiz - Commemorating the Holy Cross. 1st: Navy Day - It's an official holiday, celebrated only in the ports such as Mazatlï¿½n, Veracruz, La Paz and Acapulco. 22nd*: Father's Day - Special day celebrated with the family, in some schools children offered a festival to all fathers. 26th: Anniversary of the Death of General Ignacio Allende - Civic ceremony in Plaza Cï¿½vica. 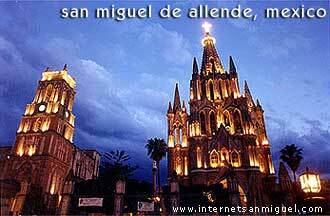 International Guitar Festival San Miguel de Allende. 11th*: Feast of Atotonilco - Colorful fiesta at Atotonilco. Indian dances. 16th: Feast of the Virgin del Carmen - Fiestas of Our Lady of Carmen launches a series of ritual celebrations that will continue until the end of the month. 30th: Anniversary of the Death of Father Miguel Hidalgo - Civic ceremonies. Fiestas Patrias, the extended fiesta season in San Miguel is crowded with events. 13th: Day of the Child Heroes - Civic ceremonies, a small parade with the army takes place at Mexico City and a noisy ceremony with canyons in Castillo de Chapultepec where the Child Heroes were in battle. 15th: El Grito - "El Grito" (the cry) Hidalgo's call for Mexican Independence. More information about "El Grito": www.sanmiguelguide.com/tour-el-grito.htm. 16th: Independence Day - Official holiday. Schools, banks, government offices and some businesses are closed. Parade in Centro streets. 3rd*: 'La Alborada', San Miguel Arcangel Birthday, patron Saint of the town - Indian dances and fireworks from midnight to dawn, in front of Parroquia. 4th*: Arrival of the Indians with Xuchiles - Xuchiles are decorations made from flowers, plants and corn paste. Music and fireworks in front of Parroquia.